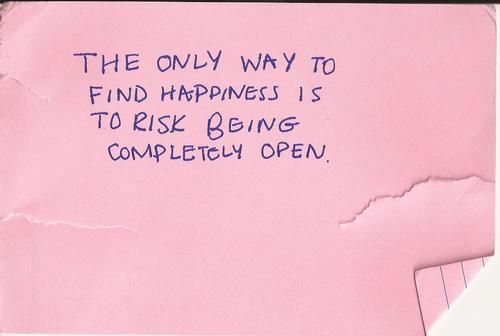 Okay, so maybe being open isn't the 'only' way to find happiness, but it certainly helps. It's often said that mindset has a big impact on the things that happen to us, and after a couple of years of working on adopting a more positive outlook, I really believe this to be true. Once we get into a negative mindset, it can be really easy to grab onto it and settle there. It feels like we have to try really hard to stay positive and optimistic, which often leads us to rest in the arms of our negativity and close ourselves off, which perpetuates our unhappiness by leaving us feeling isolated, miserable, and dissatisfied with our lives. More often than not we don't even realise that we've succumbed in this way, and instead it just feels like things are going wrong for no apparent reason, and we often place the blame on luck or karma. However, we can break out of this cycle through awareness. By becoming aware of how things are and how we feel, perhaps noticing that we've started to default to negative rather than positive thinking, or that we're closing ourselves off to the people and opportunities around us, we can start to tackle those issues and open ourselves back up. We can start trying to replace those negative thoughts with more positive, constructive ones, and we can start to work towards opening ourselves up to the universe and to others. All it takes is an open mind and an open heart – an acceptance of our circumstances, an acceptance of who others are, and an openness and honesty with our own thoughts and feelings. By being open and honest, we attract others and encourage them to feel more comfortable with being open themselves, which in turn creates more trust, honesty and communication, leading to healthier, happier relationships. Being open to what is happening around us also allows for so many more opportunities. When we're in a negative state, our inclination is to close ourselves off, and we become blind to what is being offered to us, but when we become open the world suddenly seems full of opportunities, and life becomes much more eventful and exciting, particularly as one opportunity leads to another, leading us to new places, new things and new people. This open mentality literally opens us up like a door, allowing love and light and positivity to pass both in and out of that door, which ultimately leads to better relationships, more opportunities and greater happiness. Be open, and allow happiness to come to you.